meggipeg: One Year One Outfit - THE BIG REVEAL! One Year One Outfit - THE BIG REVEAL! OK, here it is. The outfit I've been working on all year that is 100% sourced from my local corner of Western Australia. Also known as 'Pocahontas goes on a winter holiday'. The only part that is not locally sourced is the boots and the, er, underwear. This challenge was dreamt up by the quirky and creative Nicki. We had one year to create an outfit that had been 100% sourced from our local area. People from around the world have taken part including a small and enthusiastic group from Perth, Western Australia (WA), consisting of me, Carolyn, Sue and Nicki. I have to say, I could not have completed this project without the help and support of these lovely ladies. Together we have investigated local sources of fibres and textiles, experimented and learned new techniques, played with natural dyes, hand stretched silk cocoons and endlessly discussed our outfits over cups of tea and coffee. It has been stimulating, cathartic, exhausting at times (try rubbing and rolling huge pieces of felt by hand!) and always incredibly good fun. We did discuss harvesting roadkill, but abandoned the idea fairly quickly. We were going to have to get creative with Eucalyptus leaves or resort to using wool from sheep or alpacas. 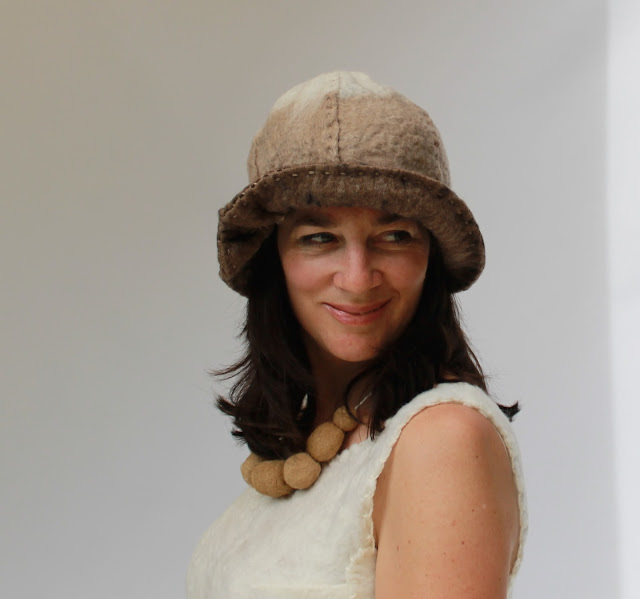 Fortunately wool is pretty fantastic and can be used in many ways. 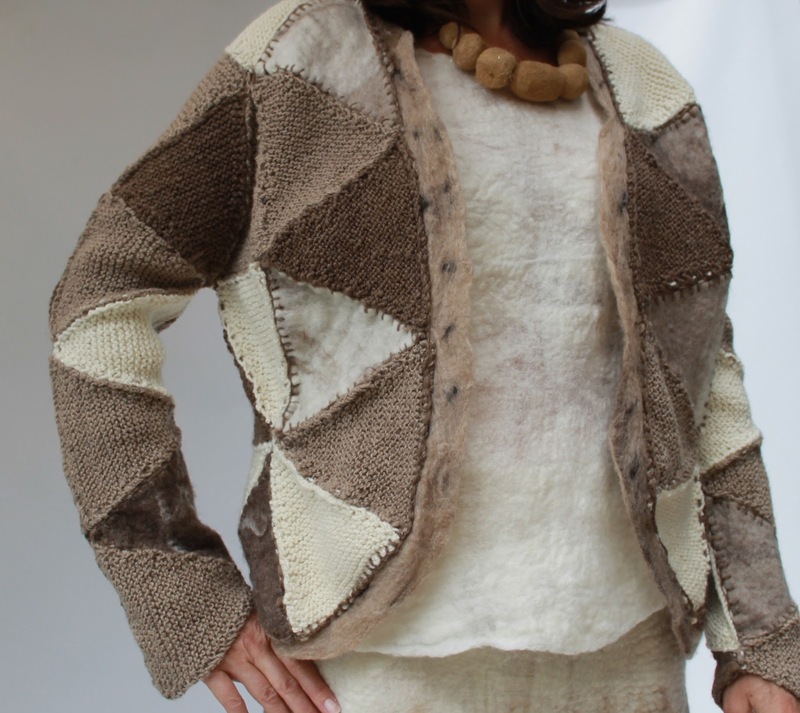 I used knitting and felting for the majority of my outfit and incorporated the natural colours of the wool into the design. Let's start with the cardigan. 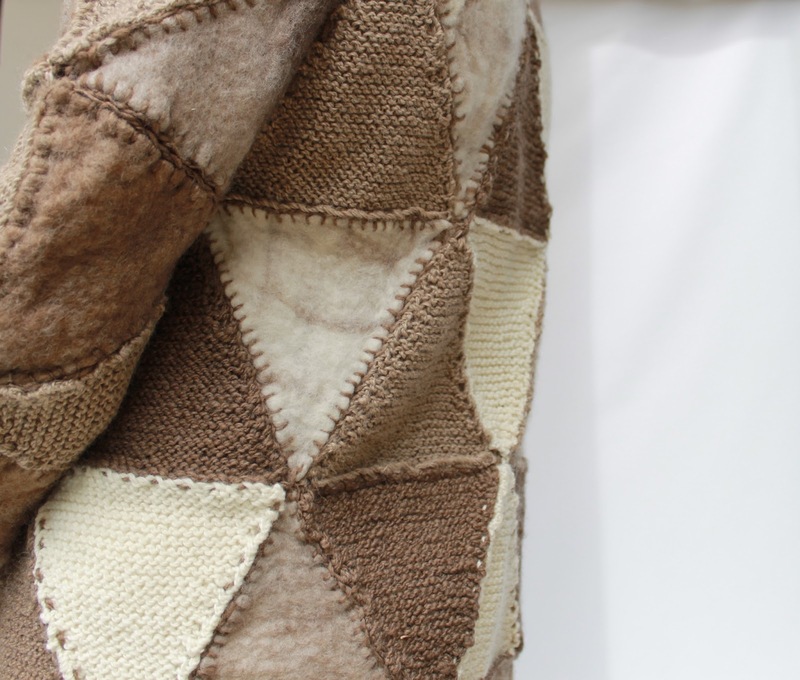 I began with a Nikki Gabriel pattern for a jumper made of knitted triangles that were sewn together. I am not a knitter, so thought triangles would be do-able. I used three colours of wool from Corriedale sheep. I knitted a few triangles and was pleased. I knitted some more and was bored. I forced myself to knit even more. I knitted throughout a tropical Singapore holiday, on the plane, in the hotel, even at Universal Studios. By this point I was about halfway through the triangles and decided that if I had to knit another one I would go stark raving mad. Then I suddenly had the brainwave to fill in the gaps with felted triangles. Felting! So much quicker than knitting...until you decide to blanket stitch all the edges before sewing the triangles together. At least it was a change from the interminable knitting. I gradually pieced the triangles together in a random mixture of colour, knitted and felted and it evolved into this cardigan. 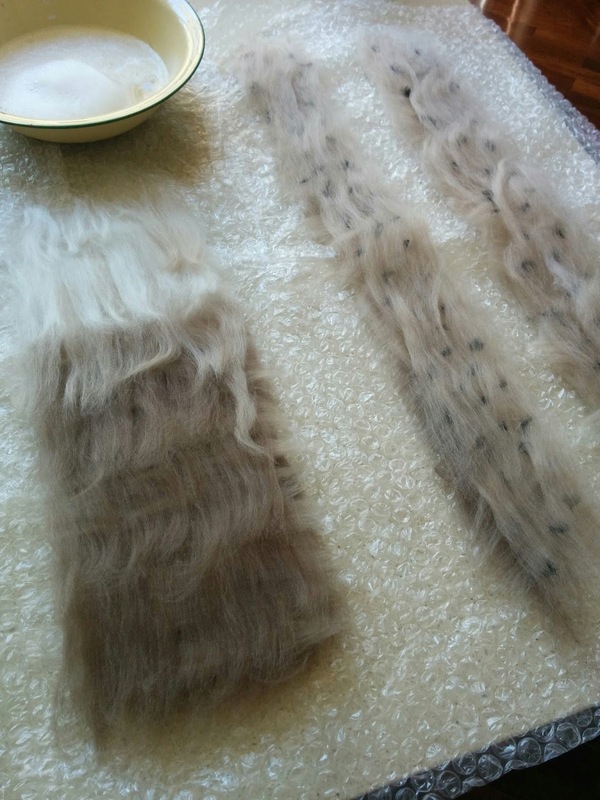 I finished the edges with a felted strip of mid-brown wool and black splotches of Truffle (dog) fur. The cardi is rustic to say the least. I think it is a bit much worn with the rest of the outfit, but I do quite like it and it might look ok with jeans or something else less, well, woolen. The different textures are kind of cool and some of the felt looks almost like leather. So, what else do we have. Oh, more felt! OK, I was perhaps not as creative as I could have been with my treatment of the wool. It's all knitted, felted or stitched. 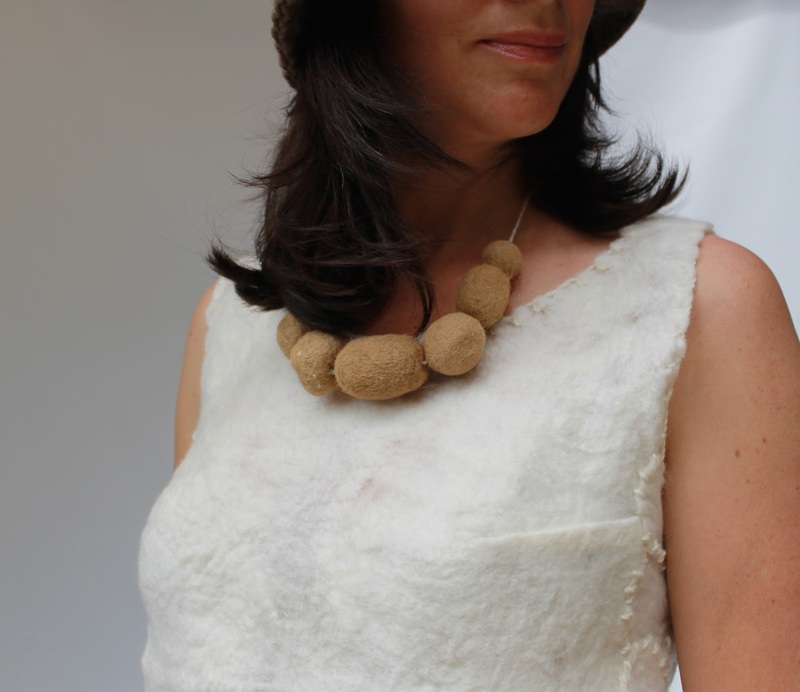 The other parts of the outfit consist of a felted top, skirt and hat. 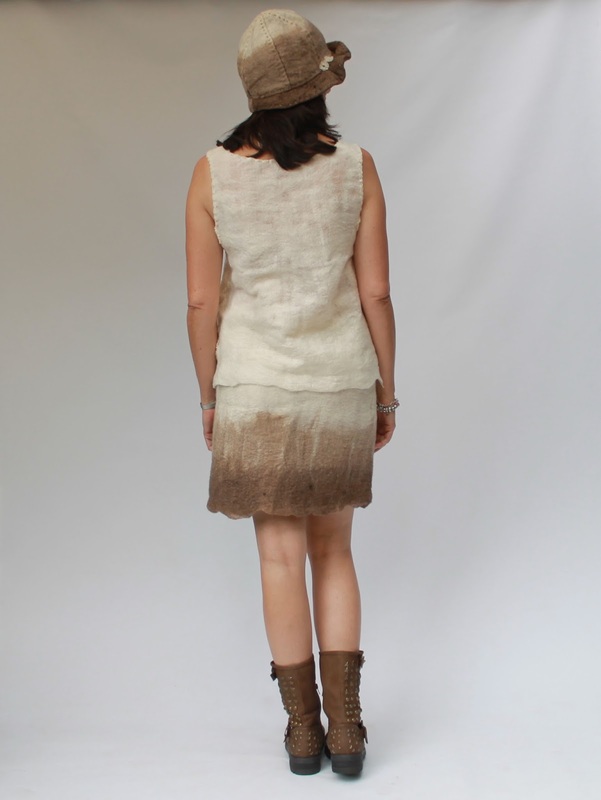 I've mentioned before about the ombre felted skirt. 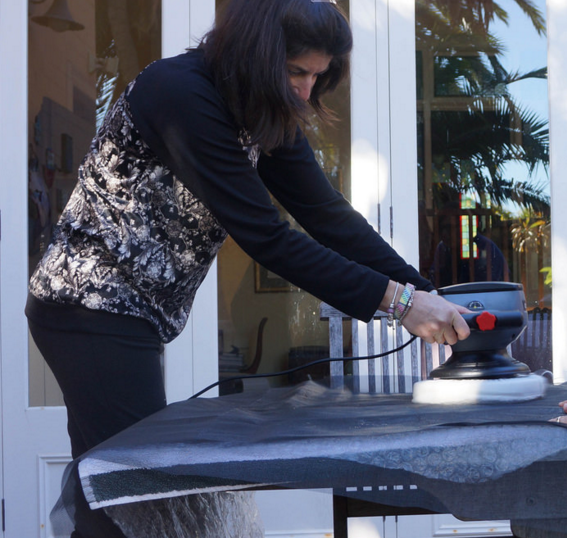 Sue was a huge help with the felting and, after the first session, she discovered that her car polisher sped up the soapy water rubbing process no end. I used Sue's polisher to felt my skirt into a tube shape. 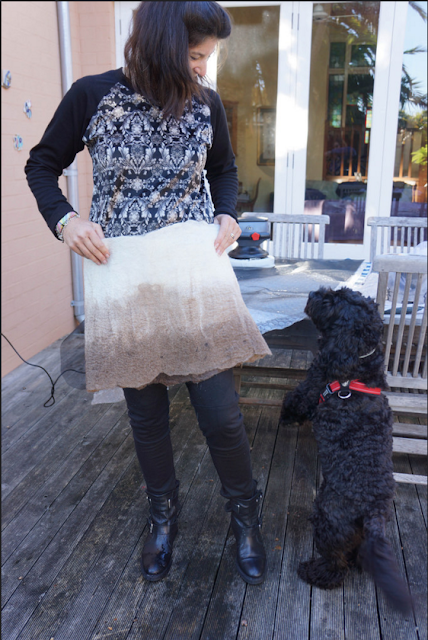 Truffle inspected the dog fur splotches in the skirt and gave them a woof of approval. 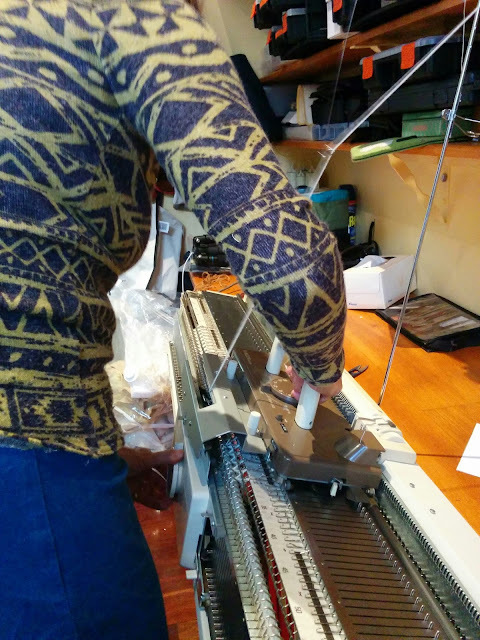 Sue also helped me knit a waistband for the skirt on her knitting machine. I say 'helped' when what I really mean is 'did it for me while I drank tea'. Sue is a legend! The top is a piece of white felt that I cut to shape using a pattern and I now can't remember which one. I didn't have quite enough for the sides, so I sewed on some felted circles that I had originally intended as embellishment. The neckline and armholes are blanket stitched for stability. The darts and shoulder seams are dry felted together with a felting needle. I'm quite pleased with the top and skirt. I'm not sure if I'll actually wear them, but they do feel light and cosy. The final part of the outfit is the accessories. 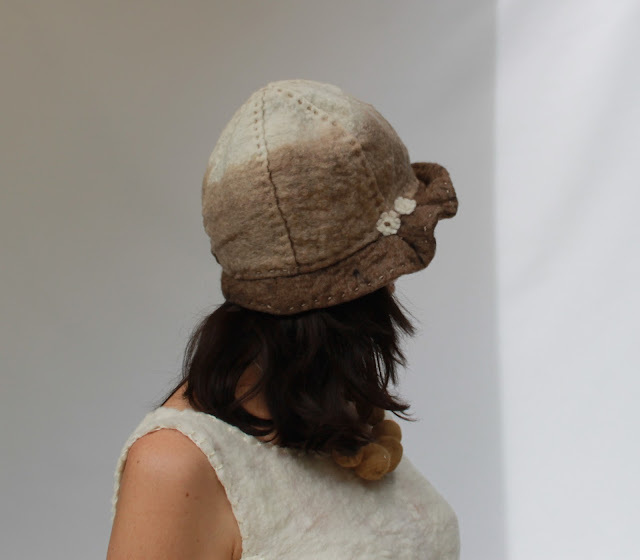 I made the hat using the Madeline hat pattern. 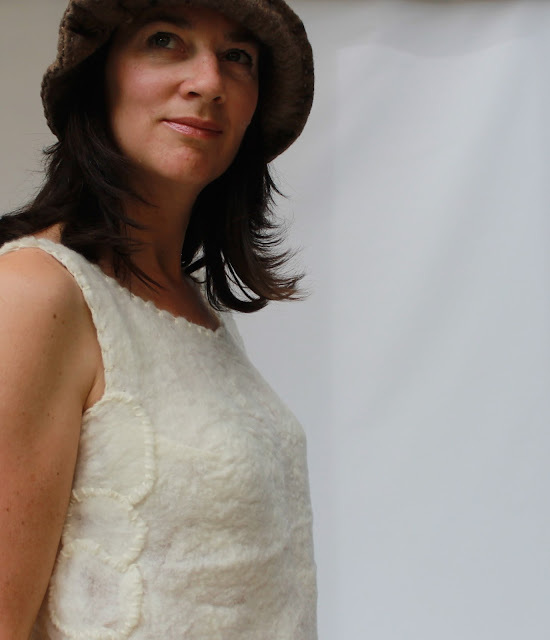 It is sewn together with wool using the Alabama Chanin hand sewing technique. I finished it off with two little felt flowers. But wait, the necklace is not wool! It is made from Neptune Balls, which are balls of WA seaweed, Posidonia oceanica, that I collected from a beach south of Perth and strung together with wool. 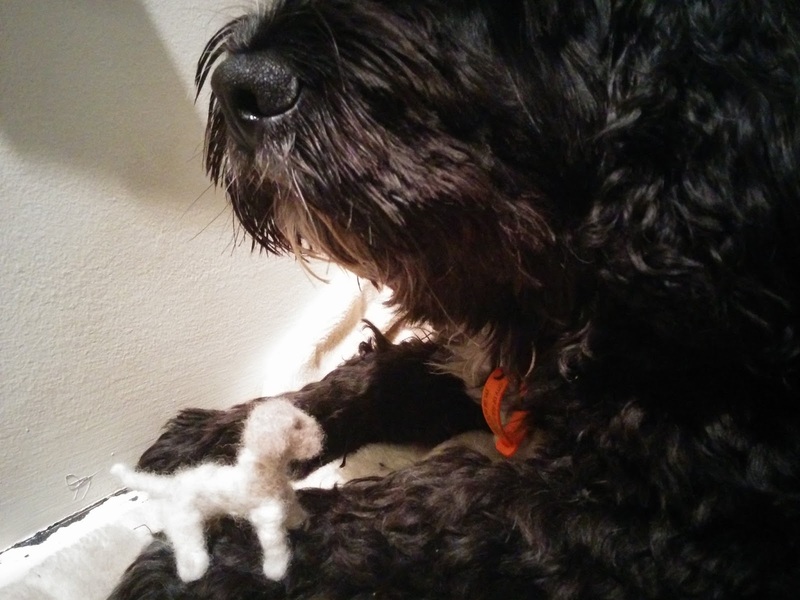 I also made a little felt dog for Truff to thank him for donating his fur to the project. So there we are. One Year One Outfit. Locally sourced and the height of fashion. OK, the latter claim is pushing it, but I am still very proud of my outfit. After all, it's not just an outfit, it's the culmination of a whole process of researching, gathering materials, experimenting, learning and creating. It's also a reminder to look at what is on your doorstep, unleash its potential and consider the environment and the mass production factories in the process. I loved this year. Thank you to my OYOO friends for all the fun, help and inspiration, to the sheep and the wool spinners and to Truff and my lovely family for their support and fur donations. To see the other stunning outfits of our merry Perth band, have a look here for Carolyn's and here for Sue's. You won't regret it. Nicki's is coming soon, so keep checking her blog. It's very impressive- love the skirt particularly. Thank you. I am pleased with the skirt too! This complete outfit is wonderful as are the outfits of the other ladies who took part. You are all so creative and inspirational. Thank you. It certainly pushes you you think outside box doing a challenge like this. Thank you Carolyn for the lovely comment. Sorry about the link, it's fixed now. Gosh, I love the entire outfit...VERY pretty and oh yes you do look stylish in it...ready to walk a runway!!!! A runway, wow! Maybe an unconventional, avant garde runway! Oh my gosh I would totally wear this, all of it all together!!! How clever to knit triangles!!! Great creative inspirational outfit! Really!? I am thrilled to hear that. Thank you! You pulled together a glorious outfit - stylish and elegant. I adore the necklace, in fact I love it all! Thank you Sue - for everything! There are so many details that are amazing, its hard to know where to start! What a fabulous experience and the end result is spectacular. You look a million (local) dollars! Ha ha, local dollars! You are very kind. I'm so pleased you like it! This is a wonderful outfit Megan. The triangle cardigan looks very stylish. You should be very proud of your efforts and I love that you have incorporated some of Truffle's fur into your outfit too. Thank you. I'm very pleased you think it's stylish and appreciate the added Truffle fur! Awesome outfit Megan - and the whole process of you creating it is fascinating - what a great idea for a challenge! I know, what a challenge indeed! Thank you for the lovely comment. You look like a model! It's a great collection of pieces and I'm sure you will wear them as each is a success in its own right. I didn't get far into researching this project; as you said I think having some local support would have helped though I'm not sure I'd have been able to give it the focus it requires. But I'm now tempted to 'agitate' some old/ruined woollen jumpers to see what pieces emerge and how I can use them. Omg! This is AMAZING! That outfit is a work of art! Gorgeous! I particularly love the triangles sweater and the ombre skirt! You should be so proud. This is the coolest. Not hilarious at all! I love the skirt top combo! I think it is quite stylish, especially the ombre skirt. I am also (accidentally) knitting some dog hair into my cardigan for OYOO, what a lovely touch to include some in your felting. Well done! I won't have a whole outfit but it was so inspiring and fun to join you all.